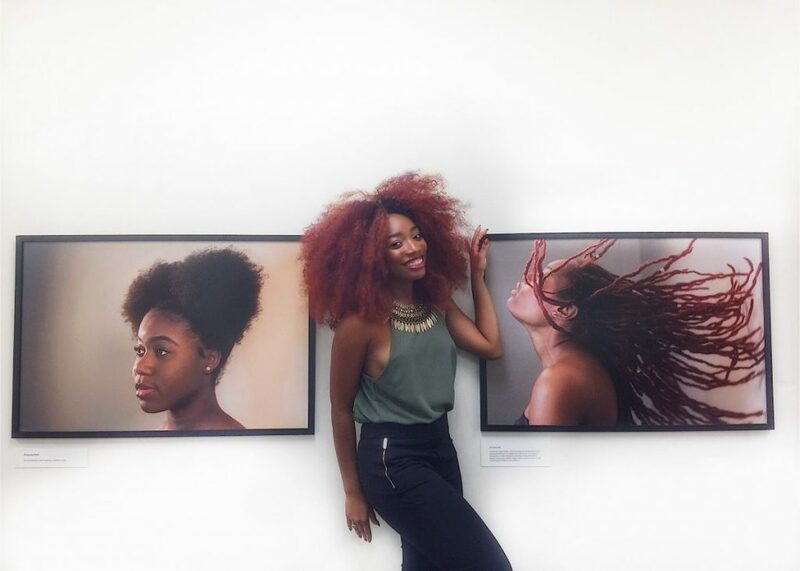 Alexis McDonald stands by two of the pieces from her "Black Hair Magic" exhibit, on display at Richter Library until the end of the fall semester. Photo courtesy Alexis McDonald. When fifth-year student Alexis McDonald took a photography class and got free rein to do a project on whatever she liked, she had one goal: to “take up space” as a black woman and to take something often criticized, demonized and politicized – black hair – and show its beauty. McDonald decided to highlight black hair in a positive light. That’s when she created the project that would lead to her latest exhibit, “Black Hair Magic,” on display in the Digital Media Lab on the first floor of the Richter Library. The portraits are of black men and women wearing different hairstyles that are often appropriated or politicized in the national debate on race. The photos have the proper names of hairstyles in the descriptions, too, because McDonald said people didn’t understand the frustration black people felt when their styles were worn by non-black people, like when Marc Jacobs’ models wore ‘mini buns’ that were actually Bantu knots. “I was just real tired of all of that press, so I decided I was going to show people black hair, the names of the styles, and show the hair on actual people it originates from,” McDonald said. The hairstyles on display are meant to make a point. “Fly Locs Fly” is a photo of a woman with long dreadlocks. McDonald said the photo was a response to the U.S. Court of Appeals ruling back in 2016 that made it legal for employers to fire or turn away applicants based solely on their hairstyle. And McDonald made it a point to include subjects of different skin tones and hairstyles, to show the breadth and diversity of blackness. As far as getting the library to showcase her art, McDonald said it wasn’t an issue. She worked closely with administrators, including E-Learning & Emerging Technologies librarian Vanessa Rodriguez. “We requested this specific collection because we find it visually appealing,” sad Rodriguez, who helped McDonald secure the space for an entire semester. The display took on greater meaning for McDonald when she started engaging in thought-provoking conversations with people who saw her work. She said even getting her art on display in the first place is a victory. McDonald said she hopes to expand the project to include black men with natural hairstyles, because they are often left out of the conversation. The exhibit will be on display until the end of the fall semester in the Digital Media Lab located on the first floor of the Richter Library.